63IB commanding officer LtCol. Carmelito Pangatungan reporting the completeness of the troops to BGen. Alan Arrojado prior the boarding to Air Force C-130 plane. CAMP GENERAL VICENTE LUKBAN, Catbalogan City – The 8th Infantry (Stormtroopers) Division Philippine Army sent another unit in the island of Sulu to augment the other maneuvering troops in compliance with President Rodrigo Roa Duterte’s government mandate against the Abu Sayyaf Terrorist Group. The send-off ceremony was conducted at Calbayog City Airport on 31 August 2016 with Brig Gen Alan R Arrojado AFP, Deputy Commander, CENTCOM as Guest of Honor and Speaker accompanied by BGen Cesar M Idio AFP, the 8ID Assistant Division Commander. During the ceremony, Capt John O Geronimo, the Division Chaplain blessed the troops for having God’s guidance in fighting the terrorists. After which, Col Mario C Lacurom, Commander 803rd Infantry “Peacemaker” Brigade presented a plaque of recognition to Lt Col Carmelito T Pangatungan, the unit Commanding Officer on behalf of the “Innovators” for their laudable services rendered in Eastern Visayas Region. Furthermore, a generous Ms. Myta Maglabus, former President of Rotary Club of Mactan gave rosaries and spiritual booklets to spare God’s wisdom and courage among the troops. In addition, Mr. Mike Ato, Deputy Officer of the Presidential Assistance for the Visayas and Mr. Kenneth Sotto, Country Director, Project Abroad Philippines donated 33 sando bags of assorted goods, three boxes of medicines/vitamins, 23 boxes of canned goods and 31 sacks of rice that will help sustain the food and medicine requirements of the troops. 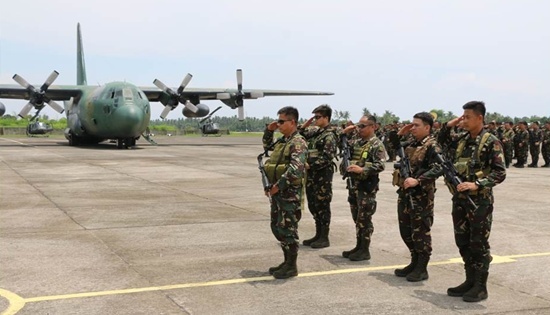 Along this line, Lt Col Carmelito T Pangatungan reported the completeness of the troops followed by the inspection by Brig Gen Alan R Arrojado prior the boarding to Air force C-130 plane. As a former Joint Task Group Sulu Commander, Brig Gen Arrojado gave points of view in accordance to his experiences in the area on what they are going to face in hunting the Abu Sayyaf Group. He gave emphasis on the provisions of Combat SOP’s and the individual tactical preparedness against the terrorists to keep in line of strength all throughout the battle. He also added to the troops on the observance of human rights despite of terrorists’ blood affinity among the residents in the area. The unit will be stationed in the area of Jolo, Sulu to conduct focused military operations. Henceforth, the AFP is asking the sympathy of the people of Sulu to support the ongoing operation to help achieve our long aspiring peace and development in the Southern Philippines. MAKATI CITY – The Department of Trade and Industry (DTI) welcomes the 2016 Global Innovation Index (GII) report, ranking the Philippines as the 74th most innovative country among 128 economies surveyed. The report jointly released by World Intellectual Property Organization (WIPO), Cornell University and INSEAD ranked 128 economies in terms of their Global Innovation Index (GII) based on 82 indicators. This 9th edition of the GII explored impacts of innovation-oriented policies on economic growth and development reflected through strategies employed by both high-income and developing countries. Top countries with highest GII include Switzerland, Sweden, UK, USA, Finland and Singapore. “We are happy to know that through this GII survey, we know how our country has improved and how Filipinos can achieve the innovation economy that we all aspire for. This would push us to extend more efforts in making innovation as a mindset for every Filipino,” said DTI Industry Promotion Group Undersecretary Nora K. Terrado. With “Winning Global Innovation,” as the GII 2016’s theme, the report discussed the growing importance of innovation among countries today in achieving future economic growth and the sharing of knowledge cross-border through global innovation networks. With GII, it includes indicators that go beyond the traditional measures of innovation such as the level of research and development that can be applied for both developed and emerging economies. The Philippines’ biggest gain is seen in human capital and research, where the Philippines ranked 95th from 123rd in 2015. It measured the quality of the country’s education with its research and development. “Innovation encompasses intensified research and development activities among universities and we hope to tap higher educational institutions with the help of other agencies like the Department of Science and Technology (DOST),” emphasized Terrado. Terrado also highlighted the collaboration of DTI and the private sector in advancing the Startup Ecosystem Development Program (SEDP) which will help enhance the climate for startup businesses, increase the success rate of Filipino innovative enterprises in introducing their products and services in the local and international markets. The country surged up in six other GII indicators: institution (88th from 102nd), infrastructure (72nd from 83rd), market sophistication (94th from 101st), business sophistication (74th from 81st), knowledge and technology outputs (44th from 53rd), and creative outputs (96th from 101st). In recent months, DTI had been aggressive in forwarding programs and activities that would encourage innovation among local entrepreneurs and would-entrepreneurs. Started during the APEC Manila 2015 hosting, SlingShot MNL was one of the pioneering programs of the department that caters to the needs of the startup sector. Earlier this year, it held a series of dialogues and consultations under the SlingShot Philippines program with the academe, private sector, other government agencies, foreign venture capitalists and individuals to seek further support in achieving the innovation economy. At present, DTI has established the QBO Innovation Hub with IdeaSpace Foundation which aims to encourage and address the needs of the growing startup and innovation ecosystem. It also launched the Food Connection Innovation Hub at the Philippine Trade Training Center (PTTC) which will target innovative enterprises in the processed food sector. DTI also reiterates its call for existing exporters to innovate as part of the strategies included in the 2015-2017 Philippine Export Development Plan (PEDP). CEBU CITY – Three among the Department of Trade and Industry’s officials namely, Undersecretary for Industry Promotion Group (IPG) Nora K. Terrado, Foreign Trade Service Corps (FTSC) Assistant Secretary Maria Roseni M. Alvero and Commercial Attaché Magnolia Uy were recently selected as 2016’s Most Influential Filipina Women in the World (Global FWN100™) by the Filipina Women’s Network. Filipinas from across four continents representing ten countries flew in to Cebu for the awarding ceremony held last August 23. The Global FWN100 Award, awarded every year by the Filipina Women’s Network (FWN), a non-profit organization that recognizes 100 women of Philippine ancestry who are changing the face of leadership in the global workplace, having reached status for outstanding work in their respective fields and are recognized for their achievement and contributions to society, mentorship and legacy. 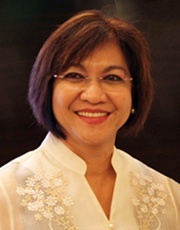 DTI Undersecretary Terrado who was a two-time awardee, first selected in 2014 under the Builders category, and now selected under the Innovators and Thought Leaders category, which recognizes women who have broken new ground in the global workplace, have delivered new and unique applications of emerging technology transforming the way people think, in the fields of sports, literature, the arts and pop culture; or have improved the lives of others by helping develop a product or service in the fields of science, technology, engineering, sports, arts, or mathematics. 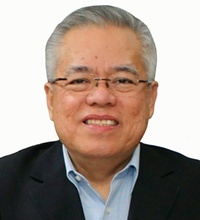 Terrado has been in the forefront of forwarding the country’s innovation agenda and currently leads the country’s trade and industry promotional efforts as the DTI Undersecretary for Industry Promotion Group. 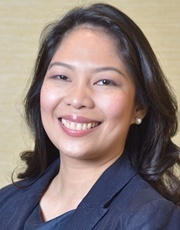 She is also known for her various contributions in implementing priority change programs at DTI during her stint as the supervising Undersecretary for Management Services Group (DTI-MSG) from 2013 to 2015. FTSC Assistant Secretary Maria Roseni M. Alvero on the other hand was selected under the KEEPERS OF THE FLAME category, an award given to those who will ensure that the Vision 2020 of FWN is kept alive: A Filipina Woman Leader in every sector of the global economy. 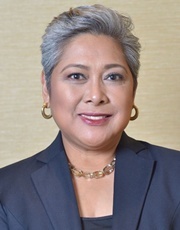 Commercial Attaché Magnolia Uy was selected under the Builders category, which honors Filipina women for demonstrating exceptional business impact at a large workplace environment; displaying deep passion for a cause through collaborative initiatives or alliances on behalf of her own organization; and demonstrating high potential and skill with measurable results in the private sector or public sector. Ms. Uy was recognised for her contribution in concluding the Philippines’ free trade agreement with the EFTA member countries (Iceland, Liechtenstein, Norway and Switzerland) as well as in putting MSMEs in front and center of the World Trade Organization (WTO) agenda. Vice President Leni Robredo was also one of the awardees and also served as the keynote speaker at the 13th Filipina Leadership Global Summit. Robredo received the award under the "Nicole" category which honors Filipino women whose words, actions and activism inspire others to act and revolutionize society’s way of understanding traditional beliefs and customs, thus leaving behind a Filipino global imprint. QUEZON CITY – Labor leaders belonging to the Bukluran ng Manggagawang Pilipino (BMP), SUPER Federation, Metro East Labor Federation (MELF), Union Presidents Against Contractualization (UPAC) and Solidarity of Workers Against Contractualization (SWAC) today denounced the lack of progress in President Rody Duterte’s vow to end contractualization and demanded that the President show more resolve in fulfilling his campaign promise. “It’s been more than fifty days since President Duterte assumed office and yet not a single capitalist or corporation has complied with the President’s order that they end contractualization,” Leody de Guzman, BMP President pointed out. “The President’s viciousness and aggressiveness towards ‘drug lords’ contrasts markedly with his apparent timidity and diffidence towards capitalists exploiting their workers,” Atty. Luke Espiritu, SUPER President pointed out. The labor leaders also scored the Employers’ Confederation of the Philippines (ECOP) for their opposition to the anti-contractualization campaign and their efforts to mislead the public by redefining contractualization and reducing it to the practice of “endo,” or terminating workers after five months of employment. They reiterated that the government should end not just “endo” but all forms of contractualization, including “casual,” “project-based,” and “sub-contracting” forms of employment. In line with their demand, the labor groups launched a “Corporate Shame Campaign” against firms and other organizations practicing or benefiting from contractualization, such as SM, PLDT, URC and Jollibee. The groups also launched a campaign to gather one million signatures demanding that the President does the following: 1) amend the labor code; repeal Article 106 to 109, 2) revoke DOLE Department Order 18-A, 3) reinforce Article 280 under the Labor Code 4) Amend the BMBE Law, 5) deputize union officials as Labor inspectors 6) criminalize the practice of contractualization. MAKATI CITY – The Department of Trade and Industry (DTI) is accelerating its initiatives to increase awareness and promote proper understanding of the ASEAN Economic Community (AEC) as well as the country’s various free trade agreements (FTAs) and preferential schemes. “We are increasing the frequency of our information and education drive and casting a wider net by continuing to conduct various fora and discussions in the regions. The knowledge our stakeholders, particularly micro, small, and medium enterprises (MSMEs), will gain from our initiatives will help us fully utilize our trade engagements and enhance our foothold in the regional and global market,” said Trade and Industry Secretary Ramon M. Lopez. The DTI has been working with business organizations to provide entrepreneurs with knowledge on how to navigate and profit from the country’s FTAs through its Doing Business in Free Trade Areas (DBFTA) initiative. The DBTA aims to increase the utilization of FTAs and covers discussions on market opportunities, tariff reductions, rules of origin (ROO) and customs procedures. According to Lopez, DTI’s awareness campaign will contribute to achieving industry competitiveness and sustaining inclusive growth. “It is imperative for our stakeholders to be aware, involved and globally competitive. Our aim is not just to reduce trepidation among our industry sectors, but also to enable them to participate more actively in international trade,” he said. From November 2010 to July 2016, the DTI conducted 964 information sessions attended by more than 100,000 participants from the private sector, academe, and other government agencies. These sessions focused on topics such as FTA, AEC, Philippine-European Free Trade Association (EFTA) European Union General System of Preferences Plus (EU-GSP+), and the United States Generalized System of Preferences (GSP). Likewise, DTI also conducts One Country, One Voice (OCOV), a trade policy consultation initiative conducted across the country which engages and involves stakeholders, particularly national agencies, local government units, business support organizations, civil society organizations, and the private sector, in the process of trade policy formulation. Launched in 2011, OCOV seeks to obtain counsel and assessments on the Philippines’ trade objectives, priorities and necessary undertakings to arrive at rational, sound and balanced trade policies in pursuit of national development. To date, consultations were conducted in key cities in the country particularly on the country’s trade engagements with Japan, EU, and EFTA. Through the Industry Roadmaps Localization Program and the AEC Gameplan, a multi-sector conference conducted across the regions, the Board of Investments also continues to capacitate industry players on how they can take advantage of the many opportunities in the AEC market by crafting their localized version of national industry roadmaps to achieve further competitiveness. “Ultimately, our work to promote awareness will enhance and intensify the Philippines as a global brand that thrives both here and the global market,” concluded Lopez. QUEZON CITY – Oftenly blamed for the return of the Marcoses into power, members of the youth collectively referred to as ‘millenials’ filed a petition for certiorari and prohibition before the Supreme Court Monday to prohibit the burial of former President Ferdinand Marcos Sr. at the Libingan ng mga Bayani (LNMB). The petition asked the High Court to declare the Memorandum issued by the Secretary of the Department National Defense last August 7 and the interment of the deposed dictator at the LNMB as ultra vires for being without legal basis and unconstitutional. Republic Act 289 stipulates that the power and authority to allow Marcos Sr. to be buried can only emanate from the Board of National Pantheon, of which Defense Secretary Delfin Lorenzana is not included. They claim that that Secretary Lorenzana may have abused his authority and must be ordered by the Supreme Court to cease from implementing his own memorandum. The petitioners, Zaira Baniaga, John Arvin Buenaagua, Joanne Lim and Juan Antonio Magalang, all students of the University of the Philippines were accompanied by their counsel, Atty. Jesus Falcis III. They also argued that the deposed dictator is disqualified from being buried at the 103-hectare Heroes’ Cemetery for he falls under the category of those ‘dishonorably separated or discharged from the service’ and was witnessed by the whole world on February 25, 1986 and that a LNMB burial for Marcos Sr. would place him in the same category as other Presidents who are already buried in the LNMB – Presidents Elpidio Quirino, Carlos Garcia, and Diosdado Macapagal, all of which were not ousted from office or found to be guilty of atrocities and ill-gotten wealth. Petitioners claim that to allow Marcos sr., an internationally recognized tyrant and plunderer to lie beside certified heroes shall create that irreconcilable repugnancy with the declaration of State policy under R.A. No. 10368 or the Human Rights Victims Reparation and Recognition Act of 2013. “We cannot with a clear conscience accept that Marcos the tyrant lie beside the nation's genuine freedom fighters. Malacañang cannot insist its will when laws have been enacted recognizing the human rights violations during the Marcos regime. The government must be consistent,” declared Baniaga. Meanwhile Lim, also a petitioner against the curfew ordinances of the cities of Manila, Quezon and Navotas said, “May this petition symbolize our eternal gratefulness to the freedom fighters of the previous generation by their unspeakable sacrifices and collective struggle we millenials enjoy what was denied of them in their youth". They also called out on his fellow ‘millenials’ to "step up and not content themselves with social media rants". “For us long as civil liberties and human rights are being threatened or being trampled upon, the idealistic youth must lend its intellect, its talent and time in order to achieve social justice with social progress, Lim concluded. TACLOBAN CITY – The Department of Social Welfare and Development’s Kalahi-CIDSS or Kapit-Bisig Laban sa Kahirapan - Comprehensive and Integrated Delivery of Social Services in Eastern Visayas region is now accepting original song entries for their 2nd Kalahi-CIDSS Kamurayaw Songwriting Competition. Lyrics of song entries must be in Filipino, Waray, Cebuano or a combination of these languages. Song entries could be based on any music genre or style (Pop, Rock, Ballad, R&B etc) with a duration of at least 3-4 minutes. “Our first Kalahi-CIDSS Kamurayaw winner is Hermie Sanchez from Catbalogan City. His winning song entitled "Kusog han Komunidad" is now the official song of Kalahi-CIDSS in the region. Through this competition, we aim to explore the creativity and artistry within our volunteers and stakeholders, especially the youth sector while promoting the Community-Driven Development strategy of Kalahi-CIDSS”, said KalahiCIDSS Regional Program Coordinator Babes Sequito. Deadline of entries is on September 15, 2016. Official entry form could be downloaded though DSWD Field Office VIII’s website www.fo8.dswd.gov.ph and www.facebook.com/KalahiCIDSSOtso/. Song entries with lyrics must be sent to the Social Marketing Unit of DSWD Field Office VIII, Magsaysay Blvd., Tacloban City, 6500 or emailed to kamurayaw2016@gmail.com. All song entries will be initially screened to obtain the Top Eight (8) finalists for the Grand Finals on September 30, 2016. The criteria are as follows: Musicality 30%, Lyrics and Messaging 30%, Originality 30% and Song Impact 10%. The Grand Champion shall receive P15,000, while the second and third place will get P10,000 and P7,000, respectively. For more inquiries, please contact Kalahi-CIDSS Region8 at 09058254440.